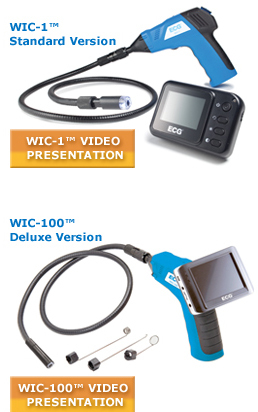 Wireless Inspection Cameras from ECG® Now Available, New WIC-100™ Deluxe Version! Let the ECG® Wireless Inspection Camera with LCD Monitor be your eyes and hands while you look inside walls without tearing them apart, search behind appliances and other difficult places for lost items and hundreds of other uses. Allows for easy visual inspections in hard to reach places. Lightweight, handheld design with flexible shaft and useful accessories. Now available in both the original Standard Version (WIC-1™) and a new Deluxe Version (WIC-100™). Typical applications include HVAC inspection, automotive inspection, cable routing, electrical and general contracting, home theater installation, plumbing inspection and anywhere else that you would use a standard borescope. WIC-1™ and WIC-100™ are trademarks of NTE Electronics, Inc.
WIC-107 4.5mm Camera/Shaft, 3.28 Ft., Waterproof (IP67) New!